This application protocol describes	every	step	from	human	Treg	and	Tresp	cell	isolation, to their	co-cultivation	in	an	in	vitro suppression	assay	using	the	Treg	Suppression	Inspector, and flow	cytometry analysis. Miltenyi	Biotec	provides	flow	cytometry	antibodies	coupled	to	a	variety	of	different	fluorochromes. We	recommend	using	the	antibodies listed below. The suppression	medium	can	be	stored	for	up	to	7	days	under	sterile	conditions	at	4 °C. When	working	with	anticoagulated	peripheral	blood	or	buffy	coat,	PBMCs	should	be	isolated	by	density	gradient	centrifugation,	for	example,	using	Ficoll-Paque™	according	to	the	manufacturer’s	instructions. Collect	a	sample	of	PBMCs	for	subsequent	flow	cytometry analysis. See "Flow cytometry analysis". Treg	and	Tresp	cells are simultaneously isolated with the CD4+ CD25+ Regulatory	T Cell	Isolation	Kit,	human, from	one blood	sample. The	Treg	cells	(CD4+ CD25+)	are	the	final	positive	fraction	and	the	Tresp	cells	(CD4+ CD25–)	are	the	final	negative	fraction. Adjust	the	volume	to	500	μL	with separation	buffer. Collect	unlabeled	cells	that	pass	through	and	wash	column twice	with	1	mL	of	separation	buffer each. Collect	total	effluent;	this	is	the	unlabeled	pre-enriched	CD4+ cell	fraction which	is	needed	for	further	Treg	and Tresp cell	isolation. The	second	step	during	Treg	and Tresp cell	isolation	is	positive	selection	of	CD25+ cells. Here,	two consecutive	MS	Columns	are	used,	with	a	capacity	of	1×10⁷ labeled	cells. To	not	exceed	the capacity,	it	is	recommended	to	determine	the	frequency	of	CD25+ cells	in	your	cell	suspension	by	flow	cytometry beforehand. To	assess	the	purity	of	the	isolated	Treg	and	Tresp	cells,	a	flow	cytometry	analysis	must	be	performed. Please	refer	to"Surface immunofluorescent staining of Treg and Tresp cells and flow cytometry analysis" for a	detailed	protocol. Apply	cell	suspension	onto	the	column. Collect	flow-through	containing	unlabeled	Tresp	cells	(CD4+CD25–). To	increase	purity	of	CD4+CD25+ cells,	the	eluted	fraction	can	be	enriched	over	a	second	MS	Column (recommended). Repeat	the magnetic	separation	procedure	described	in	steps	1	to	6	using a	new	MS	Column. The	isolated	Treg and Tresp	cells	are	now	ready-to-use	for	in	vitro suppression assay. To	determine	the	purity	of	the	isolated	Treg	and	Tresp	cells,	perform	the flow	cytometry analysis	for	the	final	positive	(Treg	cells)	and	negative	fraction	(Tresp	cells). It	is	also	recommended	to	analyze	the	starting	fraction	(collect	a	sample	after "Isolation of PBMCs"). Volumes	given	below	are	for	up	to	1×107 cells. When	working	with	fewer	cells,	use	the	same volumes	as	indicated. When	working	with	higher	cell	numbers,	scale	up	all	reagent	volumes	and	total	volumes,	accordingly	(e.g., for	2×107 nucleated	cells,	use	twice	the	volume	of	all	indicated	reagent	volumes	and	total	volumes). Resuspend	up	to	1×107 nucleated	cells	per	70	μL of	separation buffer. Add	10	μL	of	CD4-VioBlue® and	20	μL	of	CD25-PE. Wash	cells	by	adding	1–2	mL	of	separation	buffer	per	1×107 cells	and	centrifuge	at	300×g	for	10	minutes	at	4	°C. Discard	supernatant. Resuspend	cell	pellet	in	a	suitable	amount	of	buffer	for	analysis	by	flow	cytometry. To	assess	the	purity	of	the	isolated	Treg	and	Tresp	cells,	cells are analyzed	by	flow cytometry. The	analysis	should	be	performed	with	the	cell	sample	taken	in "Isolation of PBMCs" and	the cell	samples	taken in "Magnetic separation of CD25+ cells". Identify	lymphocytes	according	to	forward	scatter	(FSC) and	sideward	scatter	(SSC, data not shown). Exclude	dead	cells	from	the	analysis	by	using	a	live/dead	cell	exclusion	marker	(e.g., PI)	(data	not	shown). Analyze	the	lymphocytes	further	for	their	expression	of	CD4	(x-axis)	and	CD25	(y-axis)	to	assess	the	frequency	of	CD4+CD25+ Treg	cells	and	of	CD4+CD25- Tresp	cells	in	the	starting	fraction	(A in figure below), as	well	as	in	the	isolated	fractions	(B in figure below). 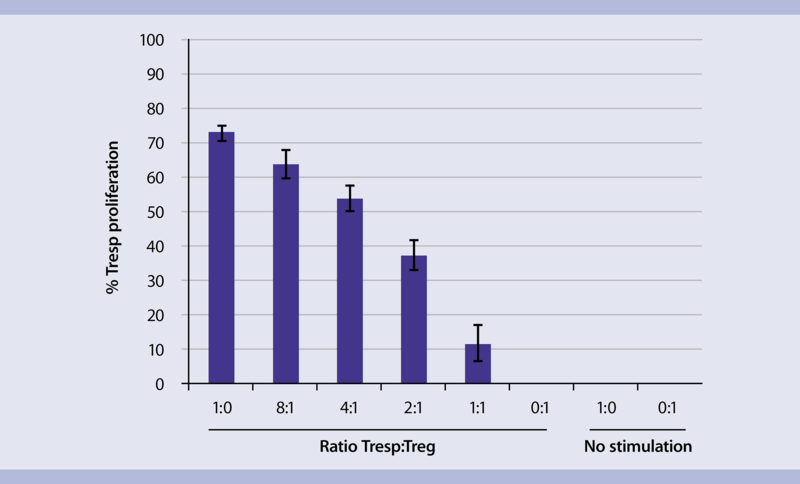 Purity	of	isolated	Treg	and	Tresp	cells. CD4+CD25+ Treg	cells	and	CD4+CD25– Tresp	cells	were	isolated	from	human	PBMCs using	the	CD4+CD25+ Regulatory	T	Cell	Isolation	Kit,	human. The	cells	were	fluorescently	labeled	with	CD4-VioBlue and	CD25-PE	before	(A)	and	after	(B)	separation. Purity of isolated Treg and Tresp cells. CD4+CD25+ Treg	cells	and	CD4+CD25– Tresp	cells	were	isolated	from	human	PBMCs using	the	CD4+CD25+ Regulatory	T	Cell	Isolation	Kit,	human. The	cells	were	fluorescently	labeled	with	CD4-VioBlue and	CD25-PE	before	(A)	and	after	(B)	separation. In	this	protocol	one	MACSiBead™ Particle	per	cell	(bead-to-cell	ratio	1:1)	is	used	for	stimulation. For	in	vitro suppression,	Treg	cells,	Tresp	cells, and the Treg	Suppression	Inspector	(amount	of MACSiBead Particles)	are co-cultured	in	different	ratios	as	depicted	in the	table	below in	a	96-well	flat-bottom	plate. To	improve	the	final	flow	cytometry	resolution,	the	cell	numbers	can	be	scaled	up accordingly (i.e., 2×105	Tresp cells	per	well, upscaling	of	Treg	cells	and	MACSiBead Particles accordingly). Number	of	Treg	cells,	Tresp	cells	and	Treg	Suppression	Inspector	(MACSiBead Particles)	per	well	of	a	96-well	flat-bottom	plate. To	monitor	the	proliferation	of	Tresp	cells	during	the	in	vitro suppression	assay,	the	cells	have	to	be	stained	with	a	fluorescent	dye, which	allows tracking	of	cell	division,	e.g., by	using	the	CellTrace™	Violet	Cell	Proliferation	Kit. For	more	information please	refer	to	the	manufacturer's	instruction. It	is	also	possible	to	use	the	CSFE-method	or	the	3H-thymidine	incorporation	method	with	this	in	vitro suppression	assay	protocol. Data	shown in	this application protocol were acquired	with	the	CellTrace Violet	Cell	Proliferation	Kit. Determine	the	total	number	of Treg	cells and	Tresp	cells. For	one	assay,	as	outlined	in	the table in "General information", 9×10⁵	Tresp	cells	and	6×10⁵	Tregs	are	needed	(if	suppression	assay	is	performed	with	higher	cell	numbers,	scale	up	the	number	of	cells	accordingly). Transfer	required	cell	numbers	of	cell	suspension	to	suitable	tubes. Add	5–10	volumes	suppression	medium	to	the	cells	and	centrifuge	at	300×g	for	10	minutes. Aspirate	supernatant	completely. Resuspend	the	Tresp	cells	(9×10⁵)	in	1800	μL	and	the	Treg	cells (6×10⁵)	in	1200	μL of	suppression	medium. ▲ Note: The	concentration	in	both cell	suspensions	is	now	5×10⁵	cells/mL. Pipette	the	appropriate	volumes	of	Treg	and	Tresp	cell	suspension	in a	96-well	flat-bottom	plate. Refer	to the table in "Preparation of Treg Suppression Inspector, human"	for	the	respective	volumes. MACSiBead Particles	are	bigger	in	size	than	MicroBeads	and	sediment	rapidly. It	is	therefore	mandatory	to	bring	the	MACSiBead Particles in	suspension	by	vortexing	prior	to	use. Resuspend	Treg	Suppression	Inspector	thoroughly	by	vortexing	and	transfer	60	μL	to	a	suitable	tube. ▲ Note: Concentration	of	Treg	Suppression	Inspector	is	2×10⁷	MACSiBead Particles	per	mL. Add	300–600	µL	of	suppression	medium	and	centrifuge	at	300×g	for	5	minutes. Aspirate	supernatant completely. Resuspend	Treg	Suppression	Inspector	in	120	μL	of	suppression	medium. The	reagent	is	now	ready	to	use. ▲ Note: Concentration	of	prepared	Treg	Suppression	Inspector	is	now	1×10⁷ MACSiBead	Particles	per	mL. Pipette	the	appropriate	volumes	of	Treg	Suppression	Inspector	(amount	of	MACSiBead Particles) to	the	Treg/Tresp	co-cultured	cells	into	the	96-well	flat-bottom	plate. Refer	to	the table	below for	the	respective	volumes. Fill	up	wells	to	a	total	volume	of	210	µL	with	suppression	medium	(see	table	below). Pipetting scheme	for	one	assay	with	a	total	volume	of 210	µL of cell	suspension per	well with	a	concentration	of 5×105 cells/mL. Incubate	the	suppression	assay	at	37	°C	and	5–7%	CO₂	for	5	days. ▲ Note: If	a	proliferation	dye	(e.g. CellTrace	or	CFSE)	was	used,	refer	to "Flow cytometry analysis"	for	detailed	description	of	final	flow	cytometry analysis. ▲ Note: If	3H-thymidine	was	used:	after	4	days	add	the	appropriate	volume	of	3H-thymidine	to	each	well	and	incubate	at	37	°C	and	5–7%	CO₂	for	16	hours. Measure	3H-thymidine	incorporation,	e.g.,	by	using	a	liquid	scintillation	counter. Harvest	the	cells	by	transferring	the	cell	suspension	of	each	well	into	a	separate	5	mL tube. Wash	cells	by	adding	1–2	mL	of	separation	buffer	for	up	to 1×10⁷ cells	and	centrifuge	at	300×g	for	10 minutes	at	4	°C. Discard	supernatant. Resuspend	cells	in	90	μL	of separation	buffer. Wash	cells	by	adding	1–2	mL	of	separation	buffer	per	1×10⁷ cells	and	centrifuge	at	300×g	for	10	minutes	at	4	°C. Discard	supernatant. Resuspend	cell	pellet	in	a	suitable	amount	of	separation	buffer	for	analysis	by	flow	cytometry. Identify	lymphocytes	according	to	FSC	and	SSC. Exclude	dead	cells	from	the	analysis	by	using	a	live/dead	cell	exclusion	marker	(e.g., PI). Gate CD4	cells	according	to CD4	(y-axis)	and	FSC	(x-axis). CD4+CD25+ Treg	cells	can	be distinguished	from	the	CD4+CD25– Tresp	cells	according	to	CD25	(y-axis)	and	CellTrace™ (x-axis)	(see A in figure below). Gate the	CellTrace-positive	cells	for	further	cell proliferation	analysis	(see A in figure below, red	gate). Apply	the	gating	strategy	to	all	samples. Analyze	the	frequency	of	proliferating cells	using a	histogram	plot	(fluorescence	intensity	of	the	CellTrace on	the	x-axis; see B in figure below)	and by determining	CellTrace dilution	(see B in figure below, red	bar). Analysis	of	an	in	vitro suppression	assay. CD4+CD25+ Treg	cells,	CD4+CD25– Tresp	cells	and	Treg	Suppression	Inspector	MACSiBead™ Particles were	co-cultured	in	different	ratios. After	5	days,	cells	were	immunofluorescently	stained with	CD4-VioBlue and	D25-PE. (A)	Gating	strategy	to	distinguish	Treg	cells	and	Tresp	cells	to	allow	further	analysis	of	Tresp	cell	proliferation	(ratio	Tresp:Treg	8:1). (B)	Representative	flow	cytometry plots	showing	CellTrace MFI	dilution	of	different	culture	conditions	(upper	row:	Tresp:Treg	1:0,	middle:	Tresp:Treg	1:1,	lower	row:	Tresp:Treg	1:0	cultured	without	Treg	Suppression	Inspector). Analysis of	an	in	vitro suppression	assay. CD4+CD25+ Treg	cells,	CD4+CD25– Tresp	cells	and	Treg	Suppression	Inspector	MACSiBead Particles were	co-cultured	in	different	ratios. After	5	days,	cells	were	immunofluorescently stained with	CD4-VioBlue and	D25-PE. (A)	Gating	strategy	to	distinguish	Treg	cells	and	Tresp	cells	to	allow	further	analysis	of	Tresp	cell	proliferation	(ratio	Tresp:Treg	8:1). 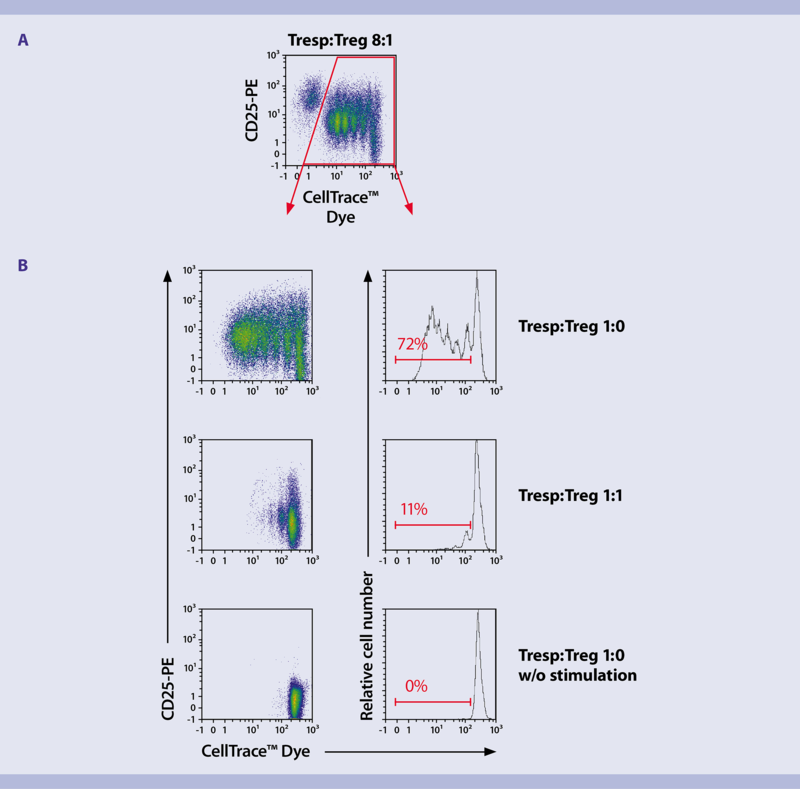 (B)	Representative	flow	cytometry plots	showing	CellTrace MFI	dilution	of	different	culture	conditions	(upper	row:	Tresp:Treg	1:0,	middle: Tresp:Treg	1:1,	lower	row:	Tresp:Treg	1:0	cultured	without	Treg	Suppression	Inspector). The	data	obtained	by	flow	cytometry analysis	can	be	summarized	in	a	graphic	as depicted	in	the figure	below. Summarized	data	of	an	in	vitro suppression	assay. CD4+ CD25+ Treg	cells	and	CD4+ CD25– Tresp	cells	were	isolated	from	human	PBMCs	by	using	the	CD4+ CD25+ Regulatory	T	Cell	Isolation	Kit,	human	and	cocultured with	the	Treg	Suppression	Inspector	in	an	in	vitro suppression	assay	for	5	days. The	suppressive	capacity	of Treg	cells	was	determined	by	analyzing	the proliferation	of	Tresp	cells	under different	co-culture	conditions. Summarized data of	an	in	vitro suppression	assay. CD4+ CD25+ Treg	cells	and	CD4+ CD25– Tresp	cells	were	isolated	from	human	PBMCs	by	using	the	CD4+ CD25+ Regulatory	T	Cell	Isolation	Kit,	human	and	co-cultured with	the	Treg	Suppression	Inspector	in	an	in	vitro suppression	assay	for	5	days. The	suppressive	capacity	of Treg	cells	was	determined	by	analyzing	the proliferation	of	Tresp	cells	under different	co-culture	conditions.